Memorial Wall – Lucky Paws houses a Memorial Wall within the sanctuary. We love having pictures of animals or family members who have passed on to look over our animals and add to their positive energy. Feel free to mail photos to us at anytime, they can be framed or not framed. Ash Trees – We plant trees in memory of your loved ones. By “Adopting A Tree”, you provide much needed shade for the animals as well as true a living memory! 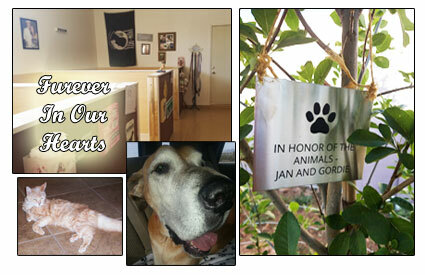 Lucky Paws will even have an engraved plaque made for each tree. These plaques are stainless steel and are attached by jute so as the tree grows, the plaques will not hinder the growth of the tree.